I want to upgrade to Windows 8, but I have two Zunes. Now that MS really doesn't support those at all anymore, what happens when I upgrade and plug them in. Will they stop working? I'm concerned and would love to know if MS has talked about this at all. Zune software works perfectly fine on Windows 8, but there's a trick to do a clean install... you have to install .NET Framework 3.5 from the Programs and Features control panel's "Add Windows Features" list. Start Screen > Type "Turn Features On" > Click Settings, and you'll see the screen listed. Okay, this conversation was giving me.. pause. Thanks for clearing it up, Good. 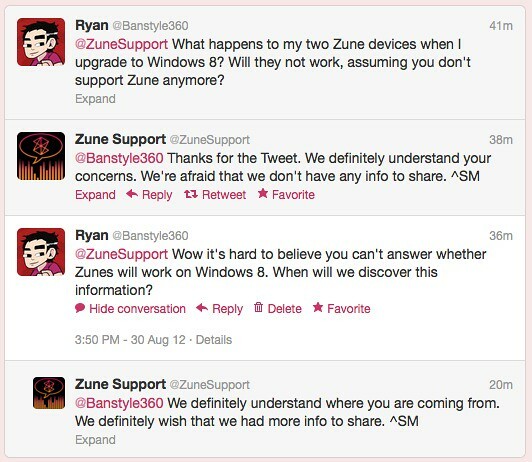 I think they probably said that since Windows 8 isn't generally available yet, and most of the Twitter Zune people are marketing instead of tech support. They're probably just trying to be "secret" in relation to the new syncing client that's supposedly coming. Windows 8 should actually pop up automatically to install .NET 2 and 3.5 rather than going into the options and adding it. I agree, being a heavy Zune user (practically my sole music service other than a little Amazon here and there) I'm really hoping Microsoft doesn't completely nix their legacy devices in Windows 8. I need to still be able to sync my Zune HD and faithful legacy 8 GB. Coulda-woulda-shoulda, but it fails to do so, because of the way it tries to run the old installers manually... Windows 8 throws up an error for most people. I find pre-installing it as I outlined above to be 100% effective. I would advise against upgrading to Win 8. I did it on two laptops and now neither can be used with Zune Pass. Both laptops are now missing from my list of computers I have attached to my account. I spent an hour in chat with one of Microsofts techs and she couldn't fix the issue. Now my Zune Pass is useless. I am beyond pissed about it. So I can either continue paying for the pass and keep the music or stop paying and lose all the music. I installed Zune on my Win8 laptop without installing anything else. This is BS, I cannot get Zune to work well with Win 8 no matter how hard I try. Give Win 8 a WIDE berth. It's the worst OS ever. You must have that .net ticked or it won't even install.